send it anywhere. He wouldn’t care. Sully’s Pub held fast in kudzu vines. The lights are buzzing strangely. and will you look at those two? This poem first appeared in Touching: Poems of Love, Longing and Desire (Fearless Books, 2011). 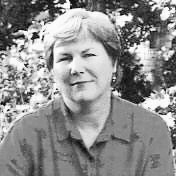 Ginny Lowe Connors is author of the poetry collection Barbarians in the Kitchen (Antrim House Books, 2005), and a chapbook, Under the Porch (Hill-Stead Museum, 2010), which won the Sunken Garden Poetry Prize. She runs a small poetry press, Grayson Books (www.graysonbooks.com), and has edited several poetry collections, including the recent Where Flowers Bloom: Poems of Elizabeth Park (Grayson Books, 2011). Among Ginny’s achievements are a Pushcart Prize nomination and the grand prize in Atlanta Review’s International Poetry Competition. An English teacher in West Hartford, Connecticut, Ginny was named “Poet of the Year” by the New England Association of Teachers of English a few years back. I was very entertained reading this! Wonderful. Loved your creative use of imagery ..."ain't love grand"! This is a great poem. Just love it! Such great images - the pub wrapped in kudzu! Pale as a candle...owww, yes. Wrap his whole life up in brown paper! I can just see it! Wonderful! Such imagery! I'm there, watching as well! Good poem!